Despite our best efforts, nearly every person will experience some form of dental injury or infection over the course of their lives. At Atrium Family Dental, our dentists can provide expert assistance with bringing back your smile’s much-needed health and ability to function through transformative restorative care. 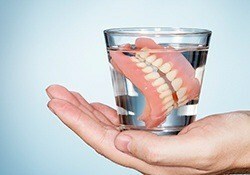 Don’t worry – we will also prioritize aesthetics so that your revitalized teeth look just as wonderful as they feel. Don’t hesitate to contact our dental office in New Lenox, IL if you have questions, or if you’d like to schedule an appointment. When natural teeth have become weakened, traumatized, infected, rendered incomplete, or even lost from the mouth altogether, repairing the missing dental structure as soon as possible is very important for the sake of the patient’s wellbeing. 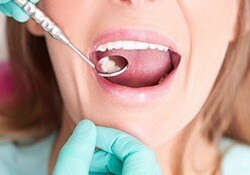 A reliable way of doing so is having a brand-new dental crown and/or bridge placed. These customized restorations are made from high-quality materials and can replenish teeth in seamless, durable, and long-lasting ways. Traditional amalgam fillings have long been the go-to solution for repairing cavities, spanning decades of use – in fact, older patients still likely have a few in their smiles. While this restorative technique had its merits, our dentists are proud to now offer an alternative that’s much more attractive, conservative, and comfortable: tooth-colored fillings. 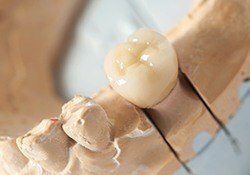 This style of modern filling is crafted from composite resin, which directly bonds with the tooth enamel and comes in a variety of lifelike shades, allowing for precise matches that will blend right in. Because of the lack of metal, patients also won’t need to worry about experiencing excessive sensitivity when heating hot or cold foods. The loss of a single natural tooth can be devastating, but when these gaps extend throughout a majority of your smile, lots of life’s simple pleasures can become embarrassingly difficult, from eating favorite foods to chatting with friends. At Atrium Family Dental, we encourage patients in this situation to visit our New Lenox office for a denture consultation. Today’s prosthetics are much more attractive, reliable, and comfortable than ever before, and we’ll design the ideal fit for your mouth that results in a much-improved sense of oral function and self-confidence. In addition to traditional full and partial dentures, implant-retained dentures are also available for unparalleled stability and permanence.